Will your strategy get executed? I wrote a whole book (MOVE) about this question and how to deal with it. Did you have the fight yet? Something that has been on my mind recently is that so many executives are reluctant to have real conversations with their organizations. They prefer a “just go do it” type of interaction. This month’s Professional Development webinar was on the topic of Metrics that Drive Action & Results. Each Monday until the launch of my upcoming book MOVE, I’ll be sharing an important idea from the book. This week: Leaders never have all the data. 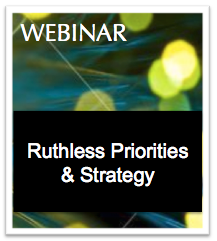 This month’s webinar was on Optimizing Revenue Growth and Innovation. Will Your New Product Win in the Market? Every month I do a webinar on a topic of business leadership and personal effectiveness as part of my membership program for business leaders. This month’s webinar was on New Product Strategies to Grow Business.